One comment I hear every time budgets for public education are discussed is, "You can't fix the educational system by throwing money at it." This pisses me off on a variety of levels. First, there's the sense that funding public schools is randomly "throwing money," as if it's inherently irresponsible to provide adequate resources for educating the next generation of citizens. Implicit in this is that schools will just waste the money anyhow, that school boards spend their time looking for frivolous ways to spend their state and federal funding. The worst part, however, is that this convenient and glib little quip ignores the truth of a different adage: "You get what you pay for." If you want to obtain and retain quality teachers, ensure that they have manageable class sizes that optimize student success, and give them the resources they need to deliver top-quality education, you have to pay for it. And it's not like if you refuse to spend tax money to fund schools, then somehow the money magically stays in your pocket. Taxpayers will pay either for supporting schools, or for the consequences of a generation of poorly-educated, disaffected young adults whose career choices are constrained by a lack of opportunities in public schools, or who have chosen to go to college and racked up hundreds of thousands of dollars in student loans that will take decades to repay. All of which is why the proposed federal education budget is such a travesty. The Washington Post calls this "Trump's education budget," which is a little doubtful, given that Trump gives every impression of having never written anything longer 140 characters, much less an actual budget proposal. The specifics, honestly, have Betsy DeVos written all over them. 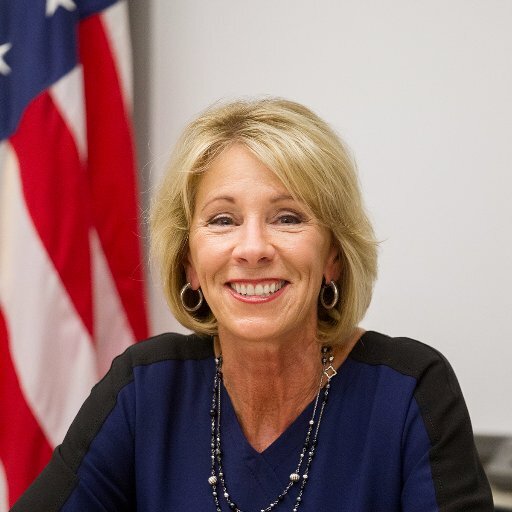 The Secretary of Education is a staunch believer in federal funding for private and religious schools -- which she refers to as "school choice" -- and for cutting damn near everything else to the bone. "It’s time for us to break out of the confines of the federal government’s arcane approach to education," DeVos said. "Washington has been in the driver’s seat for over fifty years with very little to show for its efforts." A study released last February by a team of researchers led by Jonathan Mills of Tulane University found that students in Louisiana’s expanded program lost ground in their first two years in the program. Those performing at average levels in math and reading — that is, at about the 50th percentile — fell 24 percentile points in math and eight points in reading after their first year in the program. In the second year, they improved slightly in math, though they still scored well below non-voucher students, and barely improved at all in reading. So let's take those results, and make them national by mandate! That'd be a great idea! It doesn't take an expert to recognize the terrible effect that such a diversion of funds has on schools. You'd think this would be enough for even the most diehard supporter of "school choice" to say, "Oh. I guess I was wrong, then." But no. Data, facts, and evidence have no impact on a doctrinaire ideologue like DeVos, who honestly doesn't seem to give a damn if public schools fail. In fact, if by her actions public schools do decline, in her mind it will just prove what she's claimed all along; that education in America is in a tailspin. Look, I've worked in education for thirty years. It's not that I think we're perfect. There's wastefulness, there is misspent money, and I have long decried the increasing focus on trivial content and preparation for standardized tests. But the solution is not to cut funding to the bone. Faced with revenue loss, public schools have only one real choice -- reducing staff. Most of the rest of the line items in school budgets are earmarked or non-discretionary -- school boards have no choice in whether to include them. The only big-ticket item that boards actually do have control over is salaries. But since the salary per teacher is set contractually, there's only one option: lay people off. Which means higher class sizes, cutting of electives, and loss of program. Not that DeVos would ever admit this. But look at the actual results of voucher programs and charter schools, nationwide -- not the spin that DeVos puts on it, but real numbers coming from studies such as the ones described by Hiltzik in The Los Angeles Times article linked above. The conclusion is unequivocal. And the budget being proposed will, if passed, be a death blow to the schools that can withstand it least -- poor, overcrowded, inner-city schools. Remember that next time you see Betsy DeVos smile her smarmy smile and say that she's pro-child. i don't think I want to be in this country if the educational system declines further. There is already a dearth of STEM understanding let alone logic and basic skills. Baldo — is it a dearth of STEM? Or is it big biz CLAIMING a dearth of STEM as an excuse to pay visa-ed immigrants less money?